Saturday 29 March 08: MDR & MB took a leisurely drive up to Hahndorf with a view to visiting Hans Heysen's family home. Hahndorf is in the Adelaide Hills and less than 30 minutes drive from Glenelg along an excellent motorway. Readers may remember an earlier visit by the MB family to Hahndorf in 2005. It was with some trepidation that MB & MDR crossed the threshhold of the Kaffeehaus, MB expected heads to swivel and a hushed silence as they broached the entryway, mustn't be that famous though as no one took a jot of notice. The Kaffeehaus does not appear to have changed greatly, didn't actually stop for coffee just a quick reccy. 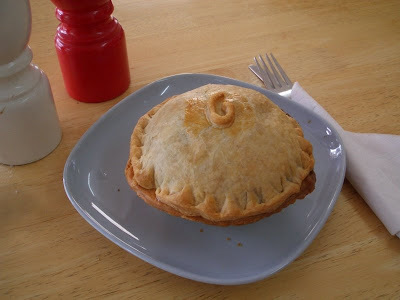 After walking the length of the very picturesque main street, MDR decided he was going to have a pie at Pot Belly Pies. MB followed suit and both ordered a beef mushroom & guinness pie. This is a very small shop that only sells hand made pies (12 varieties) and rightly deserves it's award for best pies in SA. One of the best pies MB has sampled. The special of the day was a chicken brie and cranberry which had sold out, not quite to MB's taste but obviously there are punters out there who fancy that combination.